Our exclusive offer to Travelzoo members: a deal to ride in style in one of our chauffeur driven, well-appointed fleet vehicles that will top off your already amazing travel plans. Book your next car service in the car of your choice to the airport, your cruise ship or to your favourite event with friends - we're offering this exclusive perk to Travelzoo members(for travel in the U.S. only). If you are a new asterRIDE passenger, you'll receive a 25% credit (up to $25 in value) toward your first ride. And, 10% for all future rides you book in 2018. Existing asterRIDE passengers get a 15% credit (up to $15 in value) toward a single ride. And, 10% for all future rides you book in 2018. Our free asterRIDE app, with safe-ride features, provides you luxury black car and limousine service on the go - download today! And, our professional drivers are commercially licensed and background-checked, and provide stellar, concierge-style service. Redeem this offer by downloading our app and entering your special Promo Code TZOO. Why use asterRIDE’s luxury ground transportation? Easy to book and schedule rides at your desired date and time in a vehicle of your choice. 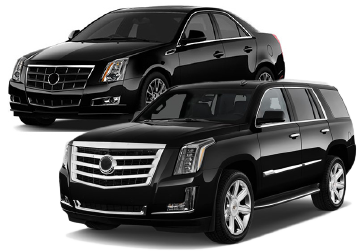 Ride with our professional chauffeurs who are commercially licensed and background-checked, and provide a stellar experience. You can keep loved ones in the know by using InstaALERT® - passenger safety and location status notifications. All of our rides are centrally dispatched through our proprietary software with built-in safeguards to ensure availability and to manage the unknowns. We and our road warriors promise to treat every ride as your most important journey. You must use your mobile device to access this perk. 1. 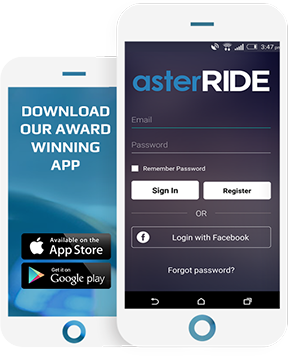 Download our free asterRIDE app from your mobile device using the link above. 2. If you're a new user, follow instructions to register. If you're an existing user, please log in. 3. When you're ready to schedule enter your pickup and destination locations, set your pick-up date and time and choose your vehicle. 4. Enter promo code TZOO. Credit will be applied after your ride is complete. Your discount will be automatically applied to all future rides through Dec. 31, 2018. Or book via email or call us. We know you'll enjoy this experience and Love how you GO! The ride credits and the discount offer from asterRIDE will both expire as of midnight on August 31, 2018 and cannot be used in conjunction or combined with any other asterRIDE offer.